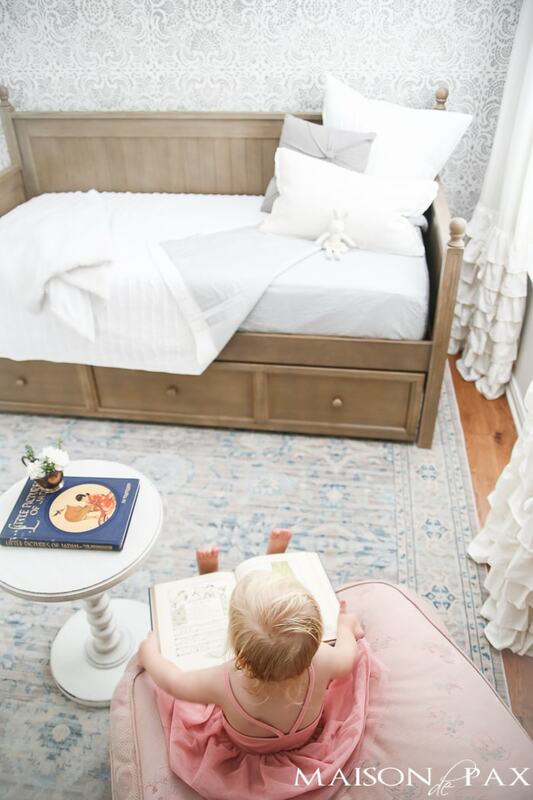 A family friendly home doesn’t have to feel like a preschool… With these kid friendly decorating ideas, you can find out how to decorate a family friendly home with grown up style! Four kiddos. Two grown ups. Do the math… we’re a little outnumbered. 😉 But one of the questions I get regularly from readers and real-life friends alike is how we have so many kiddos (and all their stuff!) without sacrificing style. Now don’t get me wrong. 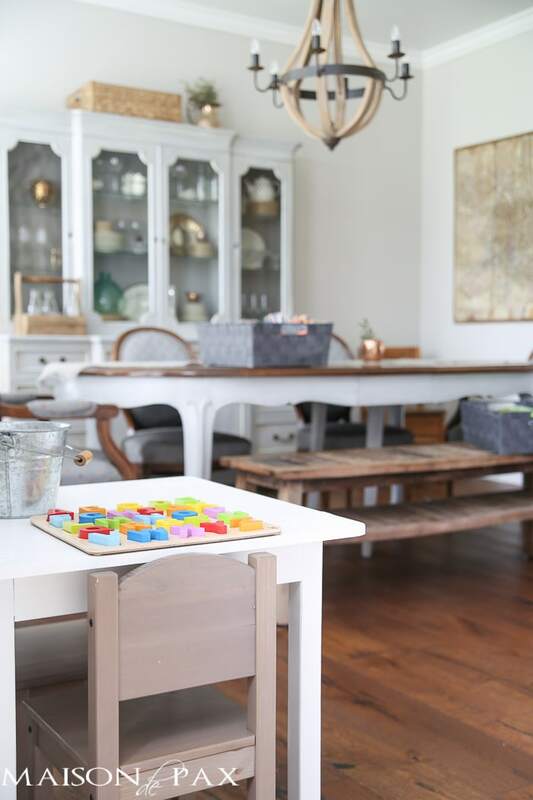 We have our fair share of swimsuits hanging in the bathroom, coloring books on the dining room table, and sippy cups left on the counter… but I firmly believe that everything needs a place (and kids probably need far less toys that we think they do – ha! ), and keeping things in their places helps tremendously with the kiddo mess. I also think that kids learn to respect their home and others’ when everything does not feel like a playground. But that’s probably another post for another day. 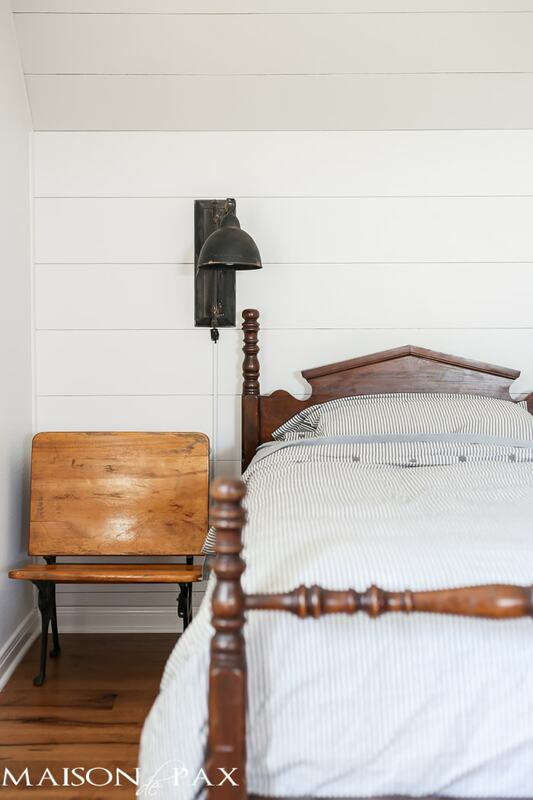 Today’s post is easy: decorating ideas that are both stylish and kid-friendly. This post contains affililiate links. Click here to read my full disclosure. 1. Use benches at tables. A bench allows us to fit more kiddos and allows easy access for them to climb up to the table on their own. Plus, if you do have fancy or upholstered chairs (i.e. not very kid-friendly), the combo bench/chairs provides a stylish alternative to getting rid of your fancy chairs entirely. 2. Try an ottoman instead of a coffee table. For the past 8 years I’ve had a toddler in the home… And I’ve become quite the expert on using ottomans instead of coffee tables as a result. 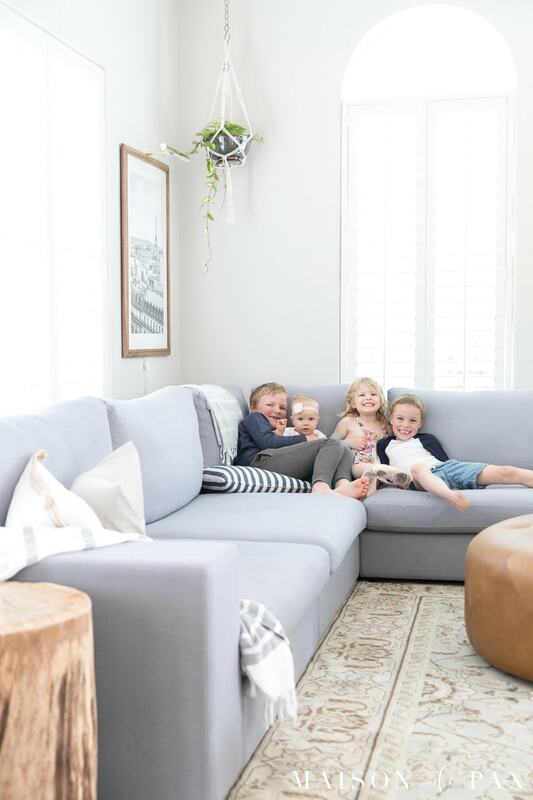 This one in our new family room has been perfect: safe, large, lightweight… the perfect soft space for the baby to stand against, the perfect stage for the bigger kids to show off their dance moves, and the perfect platform for a tray and drinks after the kiddos go to bed. 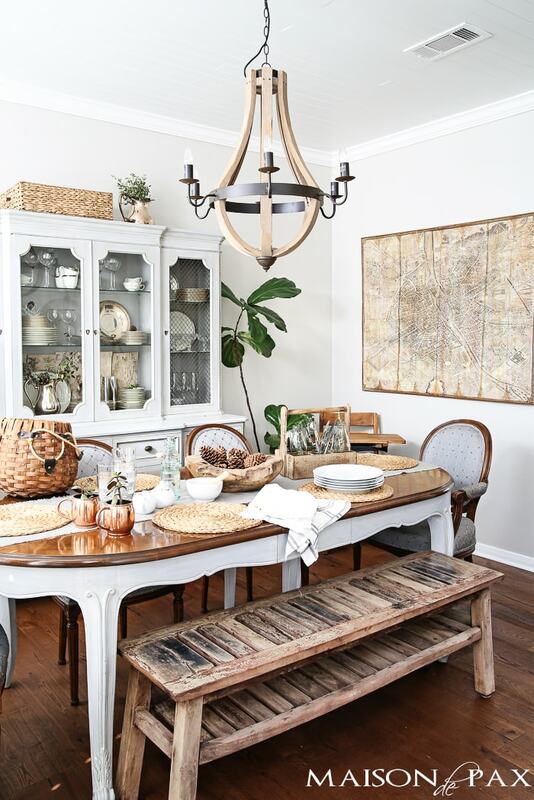 If the bench isn’t a good option for your space, try some indoor/outdoor dining chairs. They are ligthweight, wipeable, often stackable… Easy to clean yogurt, paint, or any other delightful mess your kids want to create. 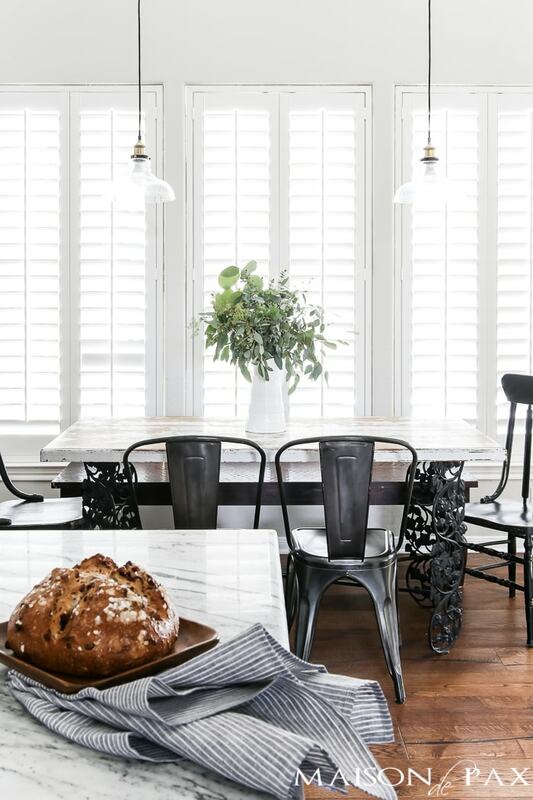 We’ve had these metal chairs at our kitchen and outdoor tables for years, and we still love them! 4. 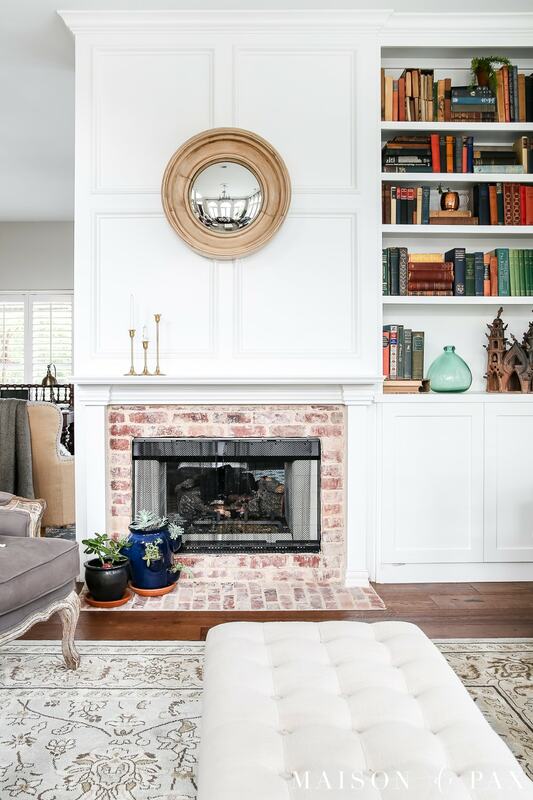 Limit kid-sized furniture to neutral colors. If you really need something kid-sized, try something neutral like this thrift store table I painted. It blends much more seamlessly with the adult spaces and still provides a special spot for the kids to create and take ownership. 5. Bring in patterned rugs. Drips, spills, muddy footprints (and the occassional Lego 😉 ) can all be minimized with patterned rugs. And no matter your style, there are patterned rugs to match your taste! 6. 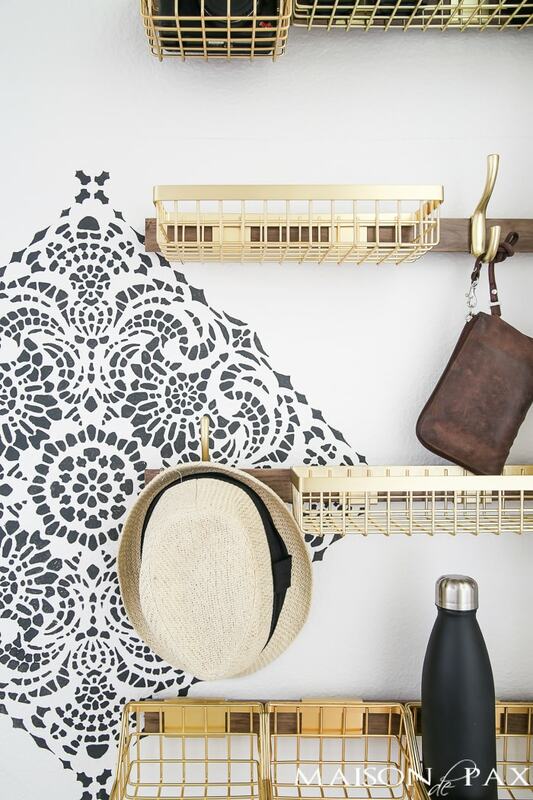 Think “outside the box” for pretty, functional storage. More kids = more shoes, more coats, more of everything… I built this shoe box to resemble an antique firewood box, and it has been the perfect spot to tuck our shoes away. Get the building plans here! There are some things that are better behind closed doors. Our family loves board games, but the beat-up, brightly colored boxes don’t lend anything to our decorating goals, so we store them in this cabinet beside our fireplace. They are still easily accessed, but we don’t have to look at them all the time. I think sometimes we want to make kid spaces “fun,” and it ends up filling it with too much stuff. I’ve found that my kiddos are able to enjoy what they have, be more creative, and take care of their own things better when we keep it simple: a few labeled toy bins, and a clean slate for the rest of their space. 10. Dream up special spaces. These are kids, after all! 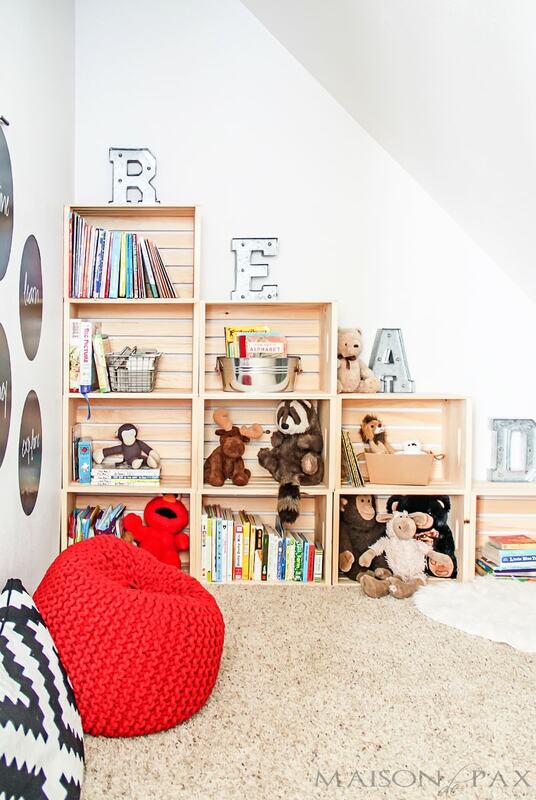 I love building a little magic into a home… and kids don’t need a large spot to do so. Convert a closet like we did or find a nook, add some cozy kid-sized decor, and let them have their own special space. 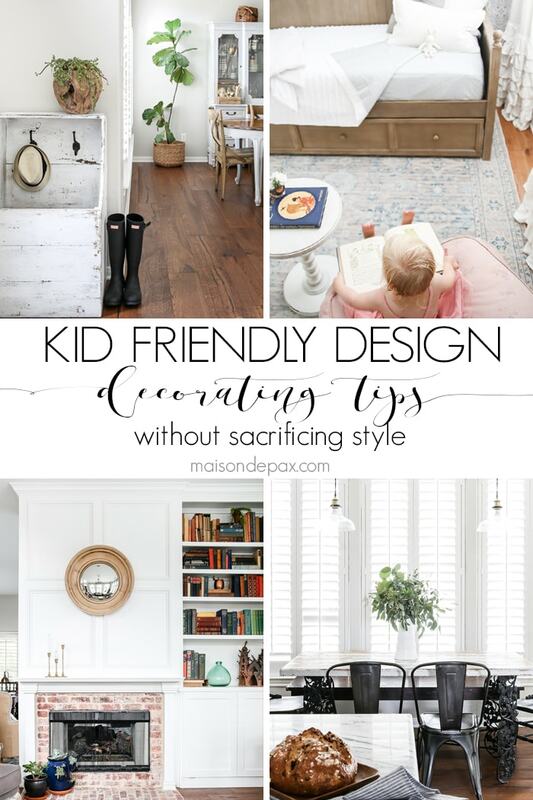 With these tips in mind, I feel like we’ve created a kid-friendly home that still feels grown up. Do they still play leap frog on the sectional? Sure. Are there currently dirty socks sitting next to me on the floor by my desk? Yes, yes there are. But for the most part, I’m proud to welcome others – adults and kids alike – into our home… And I love that because I want to have a home with open doors. 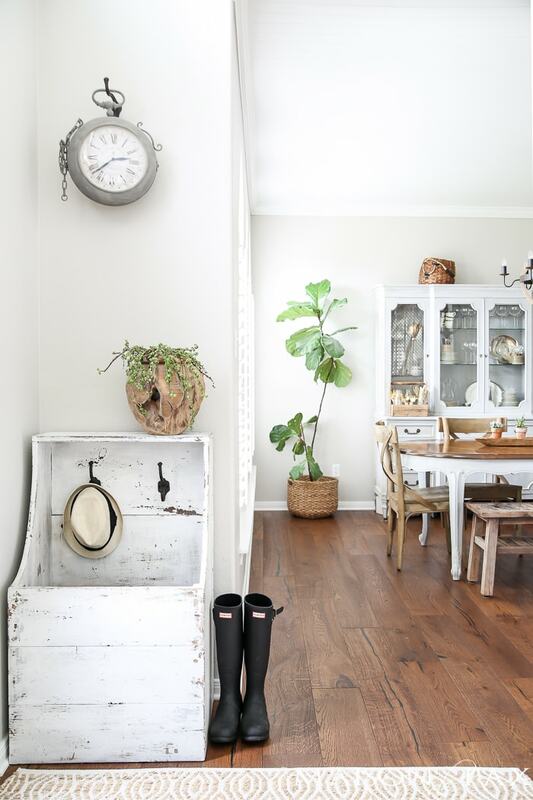 What’s your best tip for a family-friendly yet stylish home? Although my kids are grown and have families of their own, I still have the grandkids over for sleepovers and even just when they are here for the day they need things to play with. I love your ideas for keeping things kid-friendly yet still looking like an adult lives here. My grandkids range in age from 9 to 4 years old with 3 boys and 2 girls so it will be awhile before the toys are all put away forever. Enjoyed your post! Thank you! I loved what you shared—so applicable for grandparents too! I love that gray couch. Where is it from? That’s why I love the internet! It allows you taking advices from the professionals! Being a new parent is always learning-on-the-way, which is fine, everything is new and that’s the beauty in that. But in some areas it is nice to have guidance. For example the ottoman idea. I’m not sure if I would really like to get rid of my current coffee table, but kids are kids and when they have to RUN like hell they will. Doesn’t matter if they live in a tiny apartment! They will run and jump and act crazy! So the less pointy-dangerous areas the better!